News from Down Under here as Keiran Russell at Quadrant Yachts in New Zealand sends word of a $1.25 million price drop on the 25m motor yacht Savannah. 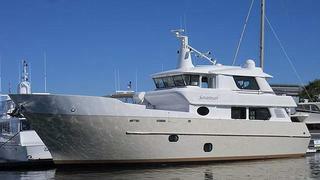 She was designed and custom built in 2011 as a long range cruiser and expedition vessel. Powered by twin low burn Perkins engines, Savannah has an indicated range of 10,000 nautical miles at 10 knots and large water bunkers allowing for extended periods at sea. Her design takes many features normally found on much larger commercial and expedition style vessels and she accommodates 12 guests in a master suite and five double staterooms. Savannah is now down from $3,650,000 to $2,400,000.